It’s been too long since I did a proper favorites post. I’ve shared them on Instagram stories or Instagram posts but haven’t on the blog in a few months. Ironically, they’re one of my favorite posts to do because I get to share everything I’m now loving with y’all and hope they make it into your loves, too! I deal with hormonal breakouts every month along my lower cheek area. I’ve used this Mario Badescu Drying Lotion at night when I have a new spot come up and by the next morning it’s not exploding on my face like it normally would (too visual?). If I can’t resist picking my face (which is never), I also love using this alcohol-free aloe toner as a compress afterward to calm it down. It works! This lavender cuticle oil was in my fall Fab Fit Fun box and I’ve used it every night since! It’s a lot easier than applying a balm I used before and doesn’t make your hands sticky. Plus, the lavender scent is perfect before bedtime. A few lip products I’ve loved and apparently y’all have been too because I’ve had a lot of questions on my Instagram stories about the color every time I wear it! I received the lip crayon product in my FabFitFun box. For real, if you haven’t signed up for that yet you need to try it! 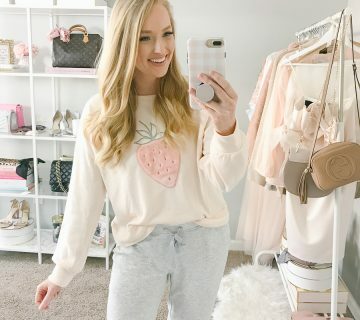 Read my FabFitFun review here if you’re still wondering about it. And no, I’m not sponsored by them. Back to the lip products… I’ve lined my lips with this product then dabbing this MAC lipstick in Velvet Teddy on my lips and it’s gorgeous for fall. I received this Pixi Lipscrub in a PR package and it has replaced my previously favorite elf lip scrub. It’s less harsh but still gets the job done. It’s also very moisturizing. I typically use it as a first step when putting on my makeup so it has time to soak in a bit before I finish with lip products (if I even apply any that day). I recently switched up my hair products to Meraki and have had amazing results. My friend Emily created her own vegan and cruelty-free hair product line after clients would ask for her recommendations yet she didn’t really have products she 100% loved. So she just #girlbossed it up (yep, I’m making that a verb) and created her own product line. My absolute favorite product is this Vitamin Mist because it’s an all-in-one pre-styling product that doesn’t make my fine hair greasy or weighed down. It helps with hair growth (with vitamin D&E), strengthens and protects against breakage, and protects against heat damage. My fly aways have diminished since I started using it! I’ve also been loving the volumizing shampoo and conditioner and the first thing I noticed was I didn’t have to use dry shampoo until the third day! It’s even Tim approved. He said it makes his hair less frizz and I definitely second that! I’ve focused on home decor the last few months and haven’t been inspired by fashion until the last week or so. That’s because it’s still been blazing hot in GA (until now). 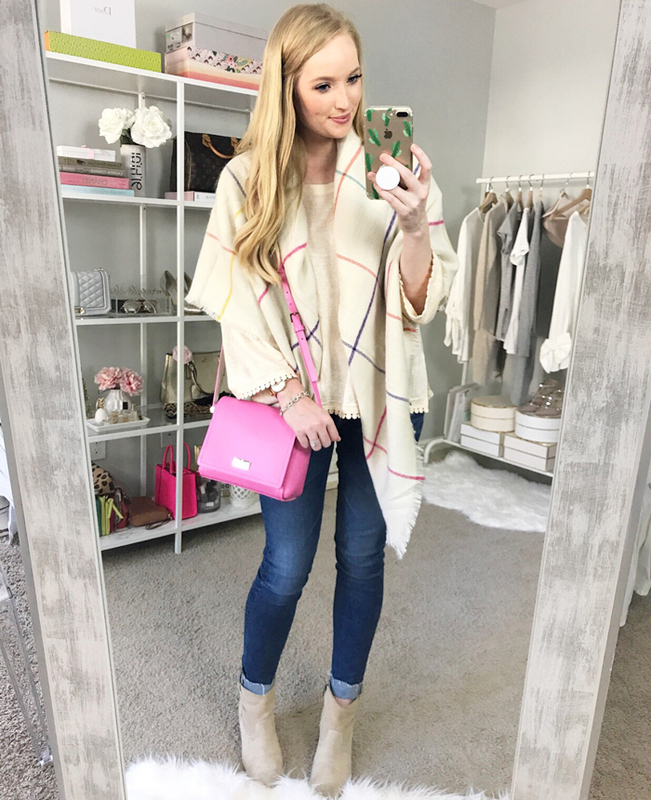 I purchased this blanket scarf during the Nordstrom Anniversary sale and finally wore it as a poncho for the first time. I fell in love with the color and pattern and it reminds me of an old school COACH print from when I worked there in college. I wore this dress for our anniversary photos and it was the favorite out of all the dresses I ordered AND it was the most affordable option. I ordered at least 7 different dresses because I’m #indecisive. You will need to get a hook put in the top to contain the girls. I’ve been loving the Sugarfix line at Target since it launched because it’s affordable and on trend. I always pick up a new piece when I’m shopping at Target. This necklace is the latest piece I picked up! We finally found an ottoman to serve as our coffee table and it makes our living room feel so homey! 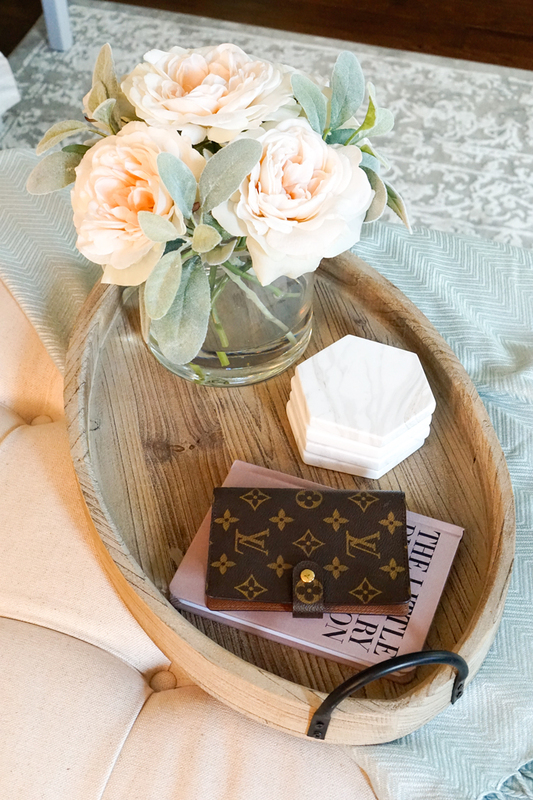 Here is an update on the tray situation since the last home decor update. 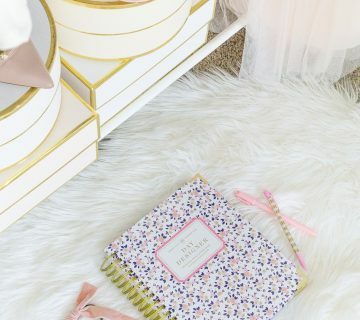 I shared where I get all of my decor coffee table books in this post! We hosted our first party ever for my coworkers to warm our house and it went smoothly! I’m not sure how I didn’t rush to get ready or burn anything 😉 Although I didn’t have time to shoot any photos other than the bar cart because by the time the food was set up guest started to arrive. We are hosting another one for family and friends very soon so now that one is under my belt I hope to shoot more pictures of the next one! My favorite post of the month was definitely our one-year anniversary shoot. We had so much fun re-visiting our wedding venue and celebrating all that we learned and have grown together in the last year. H A P P Y H A L L O W E E N! I tried to talk Tim into being a blogger so I could be an Instagram husband, but he wasn’t too thrilled with the idea of wearing my weave and willingly letting me post a picture of him 😉 What are you dressing up as? 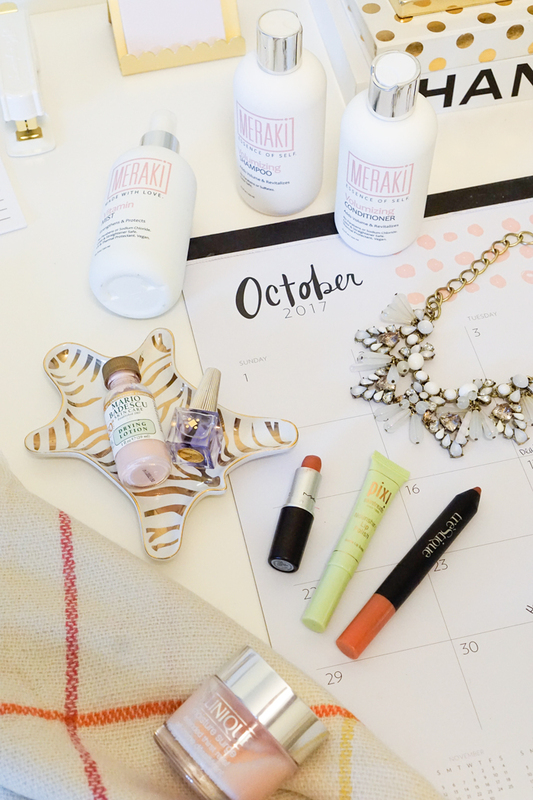 Loving this post and your October favorites girl!! These favorites are so good! Love the grey sweater. This is such a fun post! Love your anniversary shoot! So many fun things in the past month! I love how you decorated your bar cart, and your photos from the 1 year anniversary are beautiful! Your bar cart is so cute and I LOVE your blanket scarf! I haven't tried any of these products yet, but I absolutely need to. 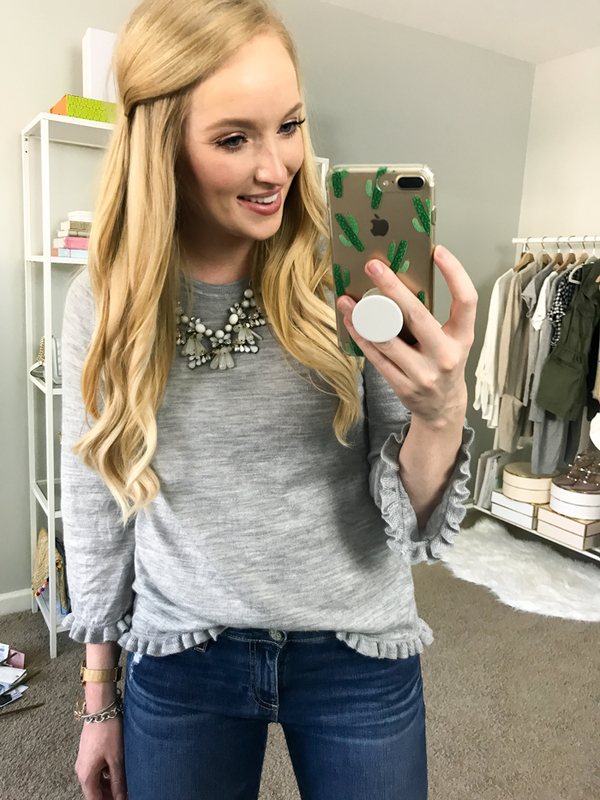 Also loving your grey ruffle sweater! 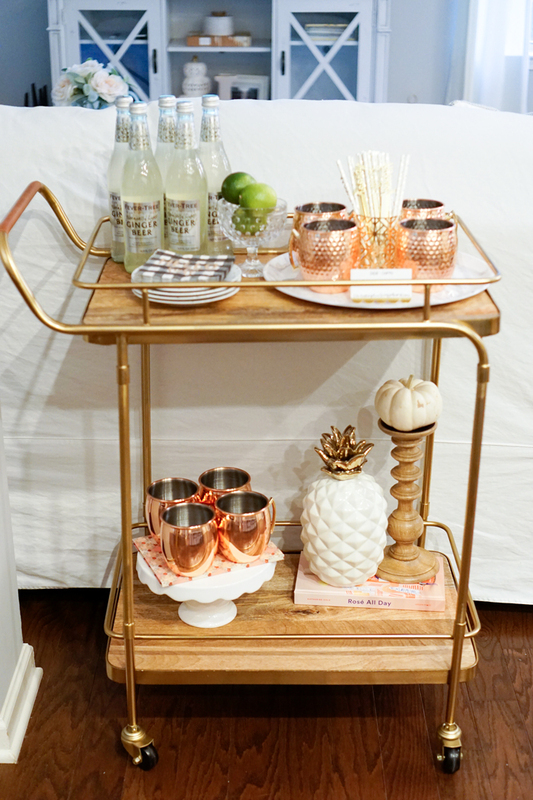 Your bar cart styling is SO on point! Your beauty product picks are fab… I'm obsessed with the Pixi lip scrub as well! Love all of these! So many great favorites! That drying lotion is the best!!!!!!! So many good pieces!! I love your bar cart, sooo cute!